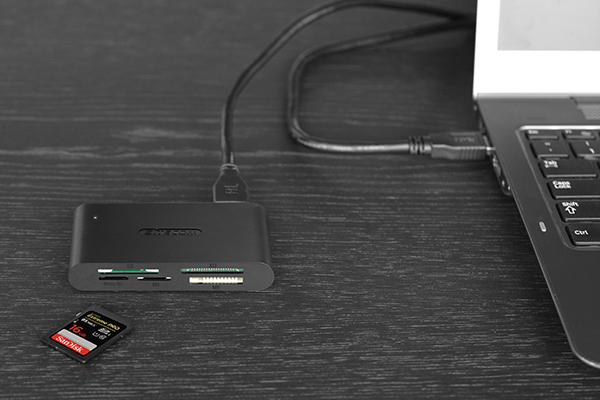 With a new generation of USB hubs and card readers, Sitecom introduces a full assortment of connectivity solutions to help users get the most out of their MacBooks, Chromebooks and Ultrabooks. Rotterdam (The Netherlands), April 2016 - Sitecom, one of the leading European brands for home networking products and connectivity solutions, introduces a line-up of USB hubs and card readers. As many of the latest Ultrabooks, Chromebooks and MacBooks come with a limited number of USB ports or lack integrated card readers, USB hubs and card readers can add functionality and increase productivity. With a portfolio of six USB hubs and five USB card readers, Sitecom presents a wide range connectivity solutions and helps users to get the most of their computers. The USB 2.0 Travel Hub 4 Port from Sitecom lets users add four USB 2.0 ports to their MacBook, Chromebook or Windows notebook. 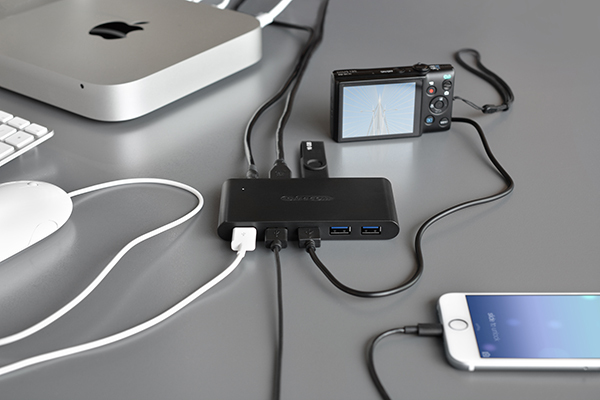 The USB travel hub does not require external power to connect USB devices, which makes it ideal hub for business travellers who want to extend the number of USB ports but do not have a power socket on hand. The hub supports Hi-Speed USB 2.0 transfer rates of up 480 Mbps per port and is fully Plug & Play out of the box. The USB 3.0 Hub 7 Port is a powered USB hub that lets user add seven USB 3.0 ports to their MacBook, Chromebook or Windows notebook. Supplied with an external power adapter, this powered hub can support any USB device, also ones with a higher power consumption such as external hard drives, phones, tablets and digital cameras. It supports SuperSpeed USB 3.0 transfer rates of up 5 Gbps per port, ideal for transferring large files such as HD movies, music collections and vacation pictures. The USB 3.0 Fast Charging Hub 4 Port is a powered USB 3.0 hub that lets users not only connect but also charge their USB devices. Supplied with an external power adapter, the combined power output of the four USB ports is 5V / 3.5 A. The smart charging chip divides the available power amongst the ports according to the devices’ needs. The hub supports SuperSpeed USB 3.0 transfer rates of up 5 Gbps per port, up to 10x faster than Hi-Speed USB 2.0. The USB 3.0 Memory Card Reader lets users read and write 63 types of memory cards. It works with various types of SD, microSD, CompactFlash (CF), xD-Picture Card, Memory Stick and MultiMediaCard (MMC). With SuperSpeed USB 3.0 transfer rates of up 5 Gbps, it lets users copy files 10x faster than with Hi-Speed USB 2.0, ideal for transferring large files such as HD movies, music collections and vacation images. The USB 2.0 All-in-One ID Card Reader combines a memory card reader with an ID card reader. It lets users verify their ID online for submitting taxes and government forms and works with national ID cards, bank cards and other smart cards. Additional software might be required and needs to be downloaded from external sites. The USB card reader also lets users read and write 25 types of memory cards. It works with SD, microSD, MultiMediaCard (MMC) and SIM cards and supports Hi-Speed USB 2.0 transfer rates of up 480 Mbps. Sitecom is one of the leading and fastest growing computer network brands for home and small business use. The Sitecom brand has a clear mission statement: “make it easy”. Sitecom makes it easy to set up a home network and to expand it, since it converts technical products into user-friendly solutions which can be used immediately without any problems. Simplicity is what it is all about! The mission statement “make it easy” is put into practice throughout the organization and is expressed in both the solutions and the service which Sitecom offers. All of Sitecom's products, therefore, have a 10-year warranty. Making the latest technology simple, understandable and accessible is what Sitecom stands for and we make no concessions to that.